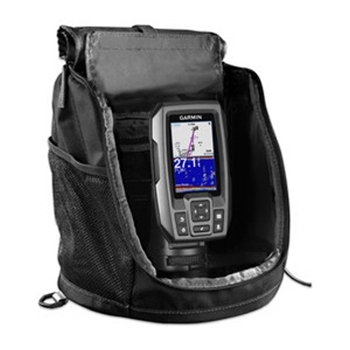 The Striker 4 portable fishfinder is a great solution for kayaking, ice fishing, and smaller boats with minimal mounting space. Rugged and waterproof and packaged with portable bag, rechargeable battery and foam float the Striker 4 Portable is ready to go to work and withstand the elements. A high sensitivity internal GPS allows you to mark waypoints and get from one point to another. Although you cannot add detailed mapping to this unit, you can still locate and save boat ramps, docks, favorite hot spots, etc. A 3.5 inch color display makes it very easy to see bottom views and all of the waypoints you have marked. Included with every Striker 4 portable is a 77/200 kHz transducer that offers CHIRP technology which provides better bottom imaging and target separation. CHIRP transducers like the one included with your Striker 4 send down continuous sweeps of frequencies so you are sure to have the best bottom views. If you need to change depths or frequency read outs on the Striker, the smooth scaling feature will kick in and give you an uninterrupted image on your display so you won’t lose the image on the screen. The sonar history rewind feature is also great to scroll back through sonar images and go back and mark waypoints you may have originally missed. Unsure of your trolling speed or want to be sure you are in the proper speed range for wake zones? The Striker 4 will provide you with on screen speed over ground right from the internal GPS so you can keep track of everything right on your display along with all of your depth and waypoint information. A built in flasher will provide you with information on whether or not the bottom where you are fishing is solid or muddy and will also provide you with the depth at which the fish are at as they move into your sonar beam. Depth ranges are 1,600 feet in freshwater and 750 feet in saltwater so you can utilize the Striker 4 in both aspects of fishing. Make the Striker 4 your option for a compact unit to fufill your fishfinding needs. Garmin Tilt/Swivel Mount for STRIKER 4 Series Fishfinders. Flush Mount your Garmin STRIKER 4 with this kit. Includes Mounting Template, Hardware and Instructions.